What was the point of all this exactly? That’s precisely the reaction that many people have to so-called “tactical urbanism” projects like this one led by the Better Block organization in Akron last year. Tactical urbanism is the process of making small, temporary adjustments to a street or other public space in order to encourage economic activity, attract people and make the area safer. In its simplest form, it might involve sketching in a crosswalk with chalk, and on the more elaborate end, it might entail filling empty storefronts with temporary businesses. 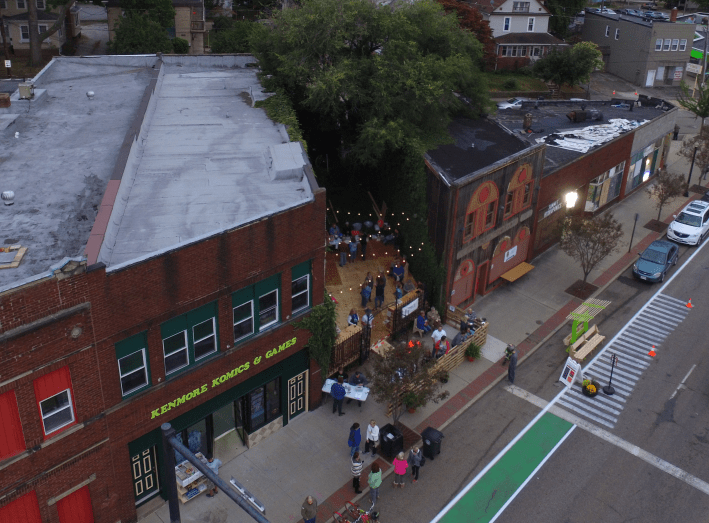 Better Block is a nonprofit that educates, equips, and empowers communities and their leaders to reshape and reactivate built environments through tactical urbanism work. But just what does putting up lawn chairs and chalking lines down the street actually accomplish — especially if it only lasts for a few days? The answer is: a surprising amount. Tactical urbanism projects have the potential to bring people together, show a neighborhood what is possible, test out ideas and inspire permanent change. These four factors were all direct results of the Better Block initiative in Kenmore, serving as a prime example of the enormous potential impact that a temporary tactical urbanism project can have — even when it’s only implemented on a handful of city blocks. 1. Tactical urbanism brings people together. Often one of the biggest hurdles to changing a neighborhood is simply getting people to talk to one another and realize that they share the same goals. When a local garden club and a bike advocacy group recognize that they both care about a neighborhood park, the power of their efforts is multiplied. When students at an elementary school can work with law enforcement to develop a safer crossing in front of their playground, everyone wins. Kenmore Better Block united many local groups and individuals in a concerted effort to improve the neighborhood. It represented the coming together of the Kenmore Neighborhood Alliance, the Akron-based Knight Foundation, city government planners, a local developer, neighborhood businesses, Akron METRO bus system, a nearby student center, a bike coop, local marketing agencies and several neighborhood music studios — not to mention hundreds of Akron residents. How often do you hear about nonprofits, government entities, businesses and individuals collaborating on something? If we want to build stronger cities, we’re not going to be able to do it with only developers or only city staff members or only nonprofit leaders. We need everyone sharing their skills and input. Tactical urbanism can accomplish that in a powerful way. 2. Tactical urbanism shows us what’s possible. It’s one thing to hear people say, “It would be nice if cars drove a little slower down this street,” or, conversely, “We can’t slow down cars here because that will create a traffic jam.” It’s quite another to actually see how the street feels when cars are slowed and to recognize the positive economic impacts of this shift for local businesses. Furthermore, such a demonstration also shows that slower cars don’t have to create a traffic jam. A vacant space between two buildings became a temporary beer garden during Better Block with the simple addition of some seating, lights and basic landscaping. Tactical urbanism efforts show us what’s possible in our neighborhoods — often beyond what we ever might have thought. They take an ignored and empty street, and fill it with businesses, people, and activity. In the case of Kenmore, the Better Block project helped bring the street back to life — and it wasn’t in a flashy, fleeting way like we often experience during a music festival or a parade where there’s a huge influx of people who come for a specific purpose, then leave right after. Rather, Kenmore Better Block made lots of small, simple changes: adding a bench here, striping some bike lanes there, stringing up a few lights in this space, putting in a planter on that corner. Together, these incremental additions gave the street a whole new lease on life. None of these activities were particularly expensive or challenging to implement; the whole thing was set up in a matter of hours. All of this shows us what is easily in reach for a street like Kenmore Boulevard. And chances are, that’s easily in reach for your street, too. 3. Tactical urbanism allows us to test out ideas. If the testers respond positively, the company applies the changes for everyone who uses their product. If the responses are negative, the company goes back to the drawing board to make improvements. This process prevents the company from angering or confusing users with unhelpful changes and it also means they’re not wasting money on something that isn’t helpful. Tactical urbanism efforts like Kenmore Better Block are applying this same principle on neighborhood streets. Rather than barreling in and ripping up all the asphalt to build a completely different type of road, tactical urbanism efforts use temporary, cheap items to subtly change the way a street looks and feels for a short amount of time. If neighbors appreciate the changes, great! Maybe they’ll be applied in a more permanent fashion soon. If neighbors dislike the changes or have feedback on how they can be implemented in a different way, that’s great too; millions of dollars haven’t been wasted on a permanent change that isn’t productive, and further tests can be utilized to come up with a better design that people will appreciate. A report by the Better Block Foundation explains that the tactical urbanism techniques employed in Kenmore offered a chance to alleviate concerns that bike lanes and sidewalk extensions might eliminate on-street parking for nearby businesses. Kenmore Better Block also showed residents that changes in street design would not hinder ambulance and fire truck access — something residents were initially worried about. Residents surveyed about Better Block activities responded positively to many of the tactical urbanist features included in the initiative and wanted many of them to continue past the event. 4. Tactical urbanism inspires lasting change. The street furniture that was constructed for this initiative continues to be used for other neighborhood events. Residents in and around Akron have started to take more notice of the Kenmore neighborhood and its local businesses. A new concert series, inspired by Kenmore Better Block, called Busk Until Dusk gets local musicians and residents out at night for drinks and socializing in the neighborhood. “Since the event, several people have expressed interest in opening businesses on the Boulevard,” reports local developer, Todd Ederer. The City of Akron’s engineering department noted some of the streetscape changes that happened during Kenmore Better Block and have them in mind for potential permanent changes in the future. 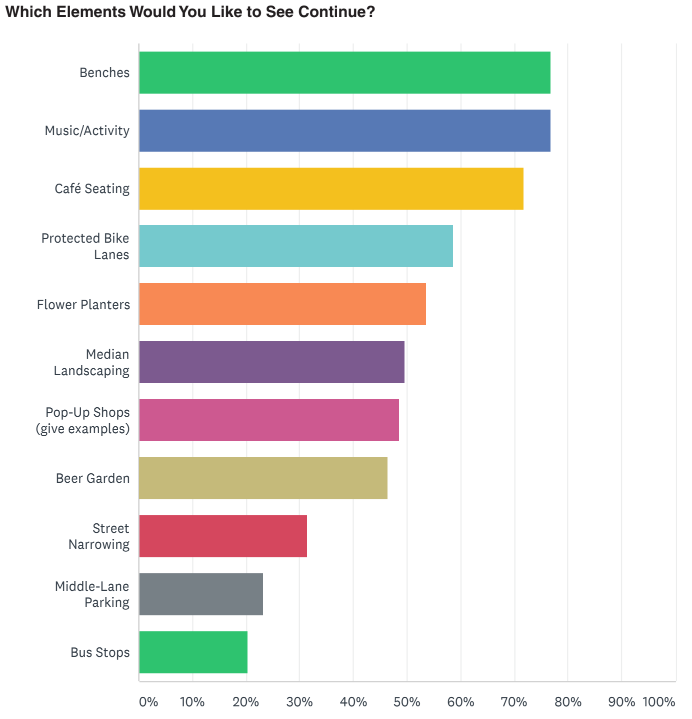 More than 70% of residents surveyed about Better Block activities said they would like the benches, cafe seating and music that was part of the event to continue. More than half wanted the protected bike lanes and flower planters to remain. Positive connections between local organizations and residents built during the Better Block initiative have persisted to this day. What sort of people could you bring together through a tactical urbanism effort? What ideas might you test out and what long term impacts might you experience in your city? Get lots more tactical urbanism ideas with this series of free guides and check out the ongoing work of Better Block to dive deeper.